Virgin Australia is converting orders it holds for 17 Boeing 737-800 aircraft into 737 MAX 8 orders. Virgin already has 23 737 MAX 8s on order, so this conversion will take its total order book for the type to 40. The airline’s first MAX delivery remains on track for 2018. The 17 737-800s that have been converted to MAX orders were due to be delivered across the 2015, 2016 and 2017 financial years. Virgin still expects to take delivery of four new 737-800s in FY16, but will also return three 737s to lessors during the year. Further, three Virgin 737-800 will be used by its low-cost carrier subsidiary Tigerair to operate international service to Bali from March 2016. Virgin chief executive John Borghetti described the conversion of 737-800 orders to MAX aircraft in terms of fuel efficiency. “Our desire has always been to have the most fuel-efficient, modern aircraft possible and clearly the opportunities that we see in front of us with the MAX and converting some orders to the MAX is very important,” Borghetti told reporters during the company’s full year results presentation in Sydney on Friday. Meanwhile, Virgin chief financial officer Sankar Narayan said the company was looking to “generate more capacity with the assets we have” as part of its overall cost reduction program. “We also have a strong focus on utilisation and actually getting more out of the planes we have,” Narayan said. Virgin said improved asset utilisation was expected to “free up two aircraft for disposal”. Those disposals and lease returns appear to have started, with Virgin Boeing 737-800 VH-VUM withdrawn from the fleet on August 2 when the aircraft was ferried from Melbourne to Jakarta, according to The VA Source website. The revised fleet order for 737s, which fly both domestically within Australia and on short-haul international destinations in New Zealand, the Pacific and Asia, comes after Virgin reported falling passenger numbers and load factors in its core domestic market in 2014/15. Total passengers declined 1.3 per cent to 17.13 million in the 12 months to June 30, compared with the prior corresponding period, while load factors dipped 1.3 percentage points to 75.6 per cent. Capacity, measured by available seats rose 0.3 per cent in 2014/15. 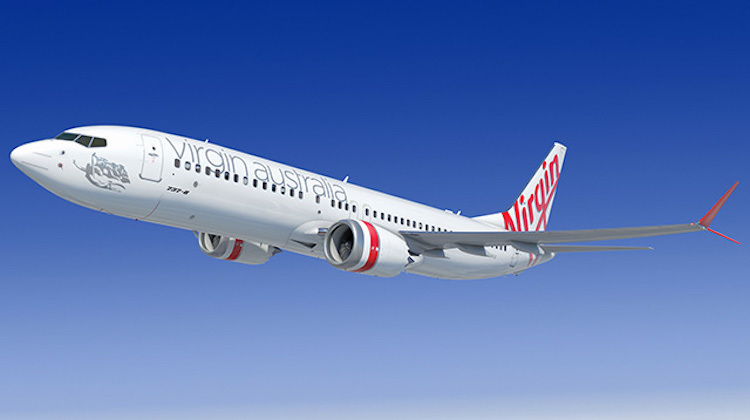 Virgin Australia placed its original order for the MAX in July 2012. Last year it announced plans to bring forward its first MAX delivery from 2019 to 2018. 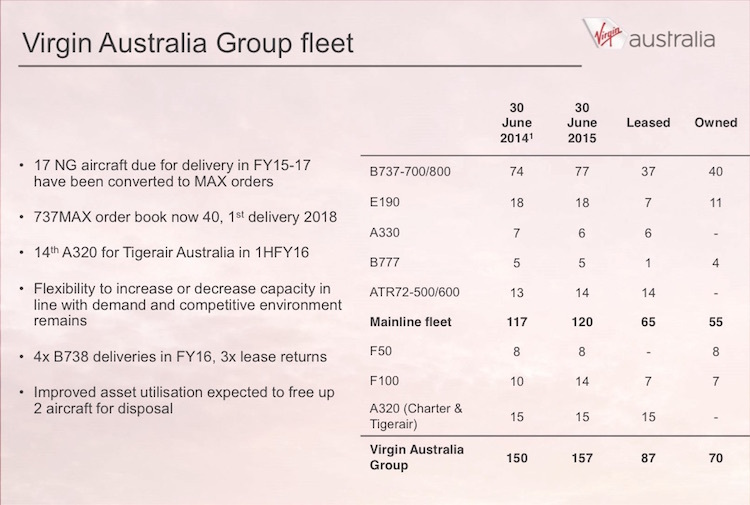 A slide detailing Virgin Australia Group fleet changes included in its FY15 annual results presentation. Could this be the start of fleet rationalisation in the Virgin Australia group? It would seem that somewhere along the line within its own needs, and with the purchase of Tigerair and FlightWest it has ended up straying into the mixed-fleet conundrum. The legacy A320 in VAR and the Tigerair A320 fleet could be rolled over with B737 MAX which would have to lower group costs longer term. The same probably applies to F100 and E190. One would have to think that fleet commonality must yield rewards regardless of low cost or premium new world designation. Hopefully the additional range-payload-yield of the B737 MAX (and A320 NEO) will open up new direct city pairs from Australia into Asia, particularly from the regional international airports like Newcastle, Sunshine Coast and Townsville. Hi Random. It costs me far far less in maintenance to keep my fully paid for 2004 car rolling each year than what it would cost in finance and depreciation charges alone if I was to go out and borrow $40k on its equivalent new model. I don’t think Random was trying to say that VA will replace F100’s With E190’s. I think he/she is referring to rationalising the entire fleet to a single airframe. I agree with you Damian. It’s funny reading people’s fleet comments as if it was like changing underwear each day. Could the conversions be seen as a delaying tactic until profits are realised? @Damian – I’m not suggesting VA will roll-over an entire fleet overnight, but I do wonder if in the longer term they will try to recapture fleet uniformity. Southwest Airlines in the US has made a science of fleet uniformity centred on B737 types, and are sure to have tailored aircraft pricing as a result. Whilst you’re correct about fully depreciated assets, there are tax advantages associated with new equipment depreciation also, that the airlines are only too happy to exploit. So whilst I wouldn’t expect VA to junk a bunch of A320 aircraft short-term, longer term VAN management may be thinking B737 MAX across the group. John, yes I think that is exactly what has happened and this is supported by the fact that Virgin has put into long term storage at least 1 B737. I am however also puzzled by the plan to move 3 B738s to Tigerair. Creating crew bases in Perth and Adelaide for one aircraft that is different to the main fleet is odd. Interesting decision. @Carigy, The only reason why these 3 B738’s are going to Tigerair is because the current A320ceo’s don’t have the range to fly MEL-DPS which is one of the 3 routes that Tigerair will operate. You’ll also find that these B738’s will be crewed by VA Mainline Pilots/Cabin Crew on secondment to Tigerair. This will however change once/if Tigerair gets their hands on some A320neo’s. In regards to SQ cancelling 7 A350 orders, they were actually asked by Airbus to cancel their last 7 airframes which are apparently headed for an “unnamed customer”. Has anybody thought that the 7 SIA 350’s they were asked to cancel for a unspecified customer, are in fact for a partner airline like VA, why would they make room on the production line for a competitor, Airbus apparently asked for the move not SIA, besides I think SIA’s balance sheet would be healthy based on their last 30 years of operation. Hi Random. Agree that ‘fleet commonality’ is always a sensible goal. But in the end if you crunch the numbers if it is cheaper to operate a mixed fleet as a (long suffering) VA shareholder I’m all for having as many types as there are letters in the alphabet if it works out cheaper. A bit of a mix probably makes sense with the WA issue. I wonder what will happen with the downturn in mining, how that affects both QF and VA. I hope the Tigerair Shorthaul works. I’ve had nothing but great flights on the 5 sectors flown in the last 12 months.